Montezuma's Revenge is a side-scrolling platformer published by Parker Brothers and released for Apple II, Atari 5200, Atari 8-bit, Commodore 64, and other 8-bit platforms in 1984. The game is considered an early example of the "Metroidvania" genre. 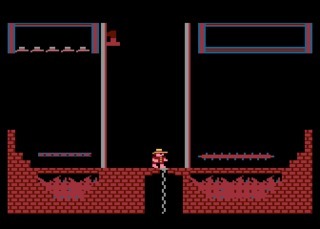 You are an archeologist (resembling Indiana Jones), exploring a dangerous Aztec pyramid, trying to collect treasures and avoid enemies and traps. Finding keys, weapons and the right objects will be required to advance through the nine floors and 99 rooms. The first version of Montezuma was created for the Atari 800 computer by a 16 years old programmer, Robert Jaeger. Parker Brothers noticed an early version of the game at the 1983 C.E.S. and convinced Jaeger to publish it internationally. Parker Brother's programmers completed the game and ported it to several platforms. Unfortunately, to release the game on cartridges, they had to cut features to store it on just 16k (instead of the 48k used by the disk version created by Jaeger). For example, the official release doesn't have an intro, bonus life animations and hi-score entry screen. It also has fewer rooms, and it doesn't include the final boss, King Montezuma itself.